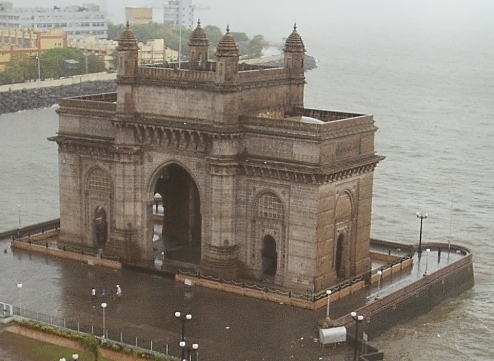 The Gateway to India in Mumbai (formerly Bombay) commemorates the visit of Britain’s King George V. in December 1911. This photograph was taken in 2001 from the window of a room on an upper floor of the adjacent Taj Mahal Hotel. In 1599 an association was formed in London, by merchants wishing to start trading with India. Queen Elizabeth I granted a Royal Charter to this association under the name Governor and Company of Merchants of London trading with the East Indies. The association became much more widely known as the East India Company. The Company’s charter was a unique case in which colonial power was wielded entirely by a private corporation under license from the British government. It expanded from a few small settlements, eliminated its competitors, among them the Dutch and French, and gradually extended its control until it commanded the entire subcontinent. The company initially devoted its energy exclusively to expanding its trading influence, but over time it resorted more and more often to military force to achieve its objectives, sometimes, but by no means always, in an attempt to bring peace to the country. In the aftermath of the Indian Rebellion of 1857, the Company was dissolved and the British Indian Empire began. It was this period that became known as the British Raj, but over time the term has been more generally applied to the entire colonial period. Later, in 1876, Queen Victoria assumed the title of Empress of India. This status remained until India won its independence in 1947, and was partitioned. Today there are the three independent democratic nations of Bangladesh, India and Pakistan. This collection will contain some significant works of history written in the 19th Century by mostly British authors, and from the British point of view. These histories cover India and its parts from the earliest times, and the 350-year period that followed the formation of the East India Company. Most of these works were written over one hundred years ago. Some words and phrases used by the authors may be considered inappropriate, or at best, insensitive, by today's standards, but those words and phrases reflected the author's point of view at the time, and were also appropriate for the cultural standards of the readers for whom these works were published. This collection currently contains over 2.5 million words. Baden Henry Baden-Powell: The Origin and Growth of Village Communities in India, published 1899. James Grant Duff: A History of the Mahrattas, in three volumes, published 1826. Mountstuart Elphinstone: The History of India, in two volumes, published 1841. Professor A. V. Williams Jackson, Editor: History of India, published 1906 et seq. Sir John Kaye and Colonel G. B. Malleson: History of the Indian Mutiny of 1857–8, in six volumes, published 1864 et seq. Colonel G. B. Malleson: The Decisive Battles of India from 1746 to 1849, published 1883. John Clark Marshman: The History of India from the Earliest Period to the Close of Lord Dalhousie’s Administration, in three volumes, published 1867. Professor Thomas William Rhys Davids: Buddhist India, published 1902. Biographies and Autobiographies of notable figures from the British Raj. Notes on spelling and accents in names.